Composition: perhydrol 10g; antifebrin 0,05 g; water to 100 ml. Pharmacological operation: Hydrogen peroxide is an antiseptic group of oxidizers. It is characterised by haemostatic, deodorizing, disinfectant effect. By the contact to the damaged skin and mucous membranes, hydrogen peroxide under the influence of enzyme catalase and peroxidase breaks up with liberation of active oxygen, that creates adverse conditions for development of microorganism (especially for anaerobic and pyogenic florae). However antiseptic action of hydrogen peroxide does not cause sterilisation. At time of use quantity of microorganisms timely reduces. At processing of wounds by the solution organic substances: proteins, blood, pus (oxidation) are disintegrated and from polluting particles of surface, from small foreign matters, blood clots mechanical clearing into the account of plentiful foaming. Foaming promotes thrombus formation and stop of bleeding from small blood vessels. • Small superficial wounds, small capillary bleedings from superficial wounds, bleeding from nose. Using rule and dosage: Outwardly (for processing of wounds) 1 % solution of hydrogen peroxide is used. 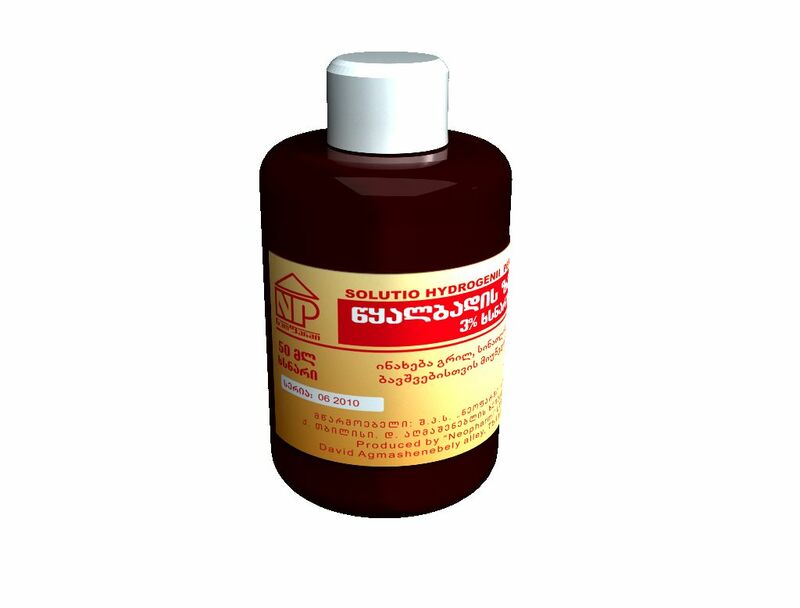 For rinsing in oral cavities and throats is used 0, 25 % solution. Interaction with other preparations: the Solution of hydrogen peroxide is non-stable in the alkaline environment, at coexistence with metals salts and difficult radicals of some oxidizers, also, in the light and heat. Side-effects: Probably: burning sensation development at wound process; on occasion – allergic reactions. Contra-indications: Additional sensitivity toward peroxide hydrogen. Special instructions: It is not used for introduction in a cavity. Overdose: Data is not available. Pregnancy and the lactation period: During pregnancy and lactation it is possible to apply a preparation. 25 ml, 80 ml solution in white colour polymeric material spray balloons. Issuing order: III group of a pharmaceutical product – issued without a prescription. Fit for using: 2 years. Storage conditions: It is stored in a dark place keep away from children. In case of the expiry of term of validity or detection of defects at visual survey, preparation use is not supposed.